I know New Zealand has some awesome spots to stargaze but I won't be able to travel when the next meteor shower happen, so since I don't know the city very well, I was wondering if you guys could help me find a spot in Auckland. Dark, open and safe place to be during the night. It doesn't need to be a camping location, I just want to be there during the night and drive back in the morning. 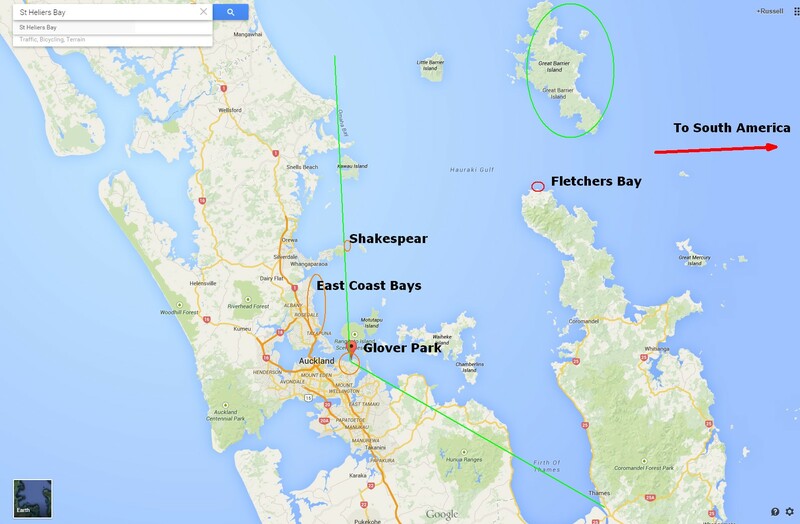 For incoming items (including most of the major meteor streams) coming from the North to Easterly direction, and not too bad for West of North as well (not so good for from the South) East the utterly marvellous location to beat most others is Glover park above the cliffs to the East of St Heliers Bay. You may be able to drive up Waitara Rd and Park - but large numbers of other cars may wish to dance with you, and a short walk from nearby is often wise. You can walk up the road, but a wander through Glover Park in the dark adds to the mystique. You get to look into an almost completely dark horizon. Some lights on Waiheke. A lighthouse sweep bright but far off on Tiritiri Matangi. Great barrier & Coromandel maybe a few dim gleams. Rangitoto dark. I've viewed the Perseids there and some others there. For meteor streams that come from a radiant and then appear to travel in all directions from it you want as dark a sky as possible over as much of the 'Welkin' as you can find. This location qualifies as you are on the coastal edge of the city with almost zero immediate civilisation and nothing very makor this side of South America. OR Go along the waterfront - a nice drive even at 3am - to St Heliers and follow Glover Road up from the far end of the bay. If you want a guide / add on and there is a major shower happening, let me know ... :-). The reason it is so good can be seen in the larger scale map below. East Coast Bays almost certainly offer some good spots. Kennedy Park above Castor Bay is probably excellent. Shakespeare Regional Park at the end of Whangaparaoa is also probably excellent - but I don't know what their rules are for night time visiting. And Fletcher's Bay at the far tip of the Coromandel Peninsular is a special place. It will take you a day to drive there, the final road in is still gravelled and the drop offs are frightening. Dark as dark it will be. And (over 40 years ago) that's where I met my wife :-). chx's top NZ sites list is interesting. All but one are in the South Island. I don't know why Ngongotaha should be better than any number of other NI locations, but, having had it noted, I'll have to find out why. The point about Glover Park is not it's "ordinary" stars alone but how good it is for a wide dark view for meteorites. I was utterly stunned by it the first time I visited. After driving through the very well lit city, which I was well used to, to come on this sudden vast Oasis of darkness is amazing. Good for random meteorites and satellites at any time. Concern was expressed re low angle viewing of the "Lyrids" this week. If I'd known that this was what it was about the answer could have accommodated it. As will be seen - information is given starting at 5 degrees above the horizon and then rising to 20 degrees + over the next 4 hours. 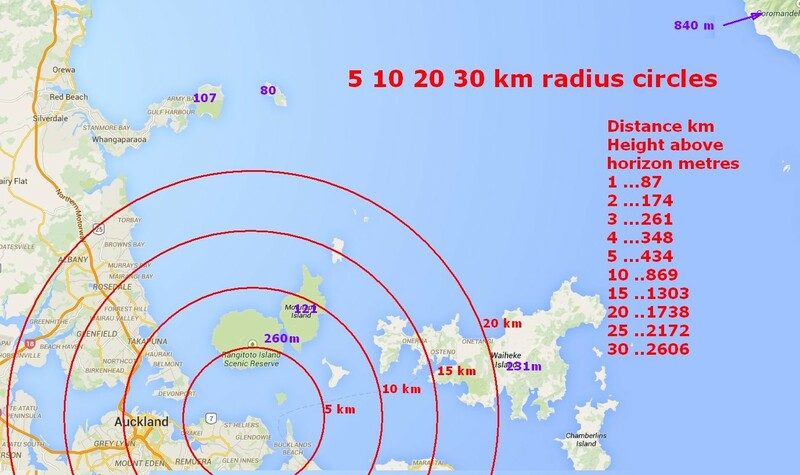 The map below shows distance from site in 5km steps. The table shows height an obstacle would need to be to block a 5 degree view. Rangitoto, 5 km away manages about 260 m when 434m is needed and nothing else comes closer. A much better site would be hard to imagine. Well, depends on how long are you willing to drive. Of the top eight stargazing spots in New Zealand one is 2.5 hours drive from Auckland: Ngongotaha. Of course, you can just visit the Stardome Observatory in Cornwall Park if you want a short trip. Not the answer you're looking for? Browse other questions tagged camping new-zealand auckland star-gazing or ask your own question. Which side of the plane to sit on an Auckland (AKL) to Queenstown (ZQN) flight? Where do I find really fast internet access in Auckland, New Zealand? Where do I find short-term house share offers in Auckland?